alaTest has collected and analyzed 48 reviews of Hitachi DZ-MV730E. The average rating for this product is 3.4/5, compared to an average rating of 4.1/5 for other Camcorders for all reviews. People are impressed by the portability and zoom. The reliability and image quality are also appreciated, but there are some mixed reviews about the price. There are some negative reviews about the size and durability. We analyzed user and expert ratings, product age and more factors. Compared to other Camcorders the Hitachi DZ-MV730E is awarded an overall alaScore™ of 79/100 = Good quality. 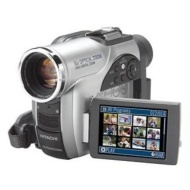 Hitachi DZ-MV730A DVD Camcorder w/16x Optical Zoom. The DZ-MV730E offers more refinement, better menu controls and more effective disc preparation than earlier DVD camcorders. Achieve an unparalleled home movie experience with advanced Hitachi DVD Camcorder technology at a great value. Record true cinematic 16: 9 widescreen for DVD-R, and DVD-Ram for easy on-screen editing and scene selection without fast forwarding or rewinding. The convenient Quick Start Recording reduces recording time from initial start up while the Quick Mode Menu reduces the On-Screen Menu to just the most commonly used features. Transfer digital stills directly to a personal computer or printer with removable memory cards. Experience the advantage of Hitachi DVD Camcorder technology.